I’m meeting tons of new people with my new job which is always exciting and a little nerve wracking for me, but fun of course. The other day I was at lunch with some customers and we were having general conversation about the weather and how their day was going etc. Most of them said the obligatory, fine, but one of the gentlemen there who I don’t know at all, opened up and talked and talked about his current extremely difficult life situation. Most of the room had left and he went on and on not wanting advice and certainly not judgement but as he put it, he wanted to verbalize what was in his head and he hoped at the end I would not think he was crazy. He apologized after spilling his guts for 45 minutes. My church is holding a mens retreat this fall called ‘The Courage to Listen’. Of course it’s for men, because they don’t listen…just kidding. Anyhow, as I listened to this virtual stranger talking about some deep stuff in his life, this phrase popped into my head because do we really have the courage to listen to people and hear the deep stuff they are going through? When we ask the question, ‘how are you?’, do we really want to know? I felt privileged to hear him rant and also felt pretty good that after only an hour of small talk with the group he thought I would even listen and not judge. When people I know and trust ask me how I’m doing I give an honest answer and sometimes it’s not positive. 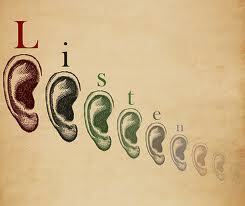 I think people are taken aback with honesty and in our fast-paced society, listening has become a lost art. I think we want to hear, ‘Fine’ as an answer so we can move on with our day but I know for me sometimes I just want to rant and not have any particular thing solved or discussed; sometimes I just want someone to listen. Do you have the courage to listen? Try it, look people in the eye and listen. Don’t try to solve and don’t interrupt. It’s amazing and enlightening and when you listen with the sole purpose of ‘hearing’, sometimes you can hear what makes a person tick, what’s in their soul. Think about your closest friend, they listen. Now think of the impact on a stranger if you truly listen. It’s a beautiful thing! Today I wear Dior Addict lipstick in Raspberry Rush. It’s a gorgeous soft shimmery pink which would look great on any skin tone. I wear it because it’s such a yummy rush making new friends from just taking the time to listen.